Job seekers can send in Sysco application for a chance to work for one of the most successful American multinational corporations. Founded in 1969, Sysco (Systems and Services Company) specializes in food product delivery and marketing. It has more than 400,000 clients including restaurants, hotels, healthcare and educational facilities, as well as many other hospitality companies. Submit your Sysco application today! Monday -Thursday: 8:00 A.M. – 4:30 P.M.
Friday – Saturday: 8:00 A.M. – 4:00 P.M. Candidates are advised to go to www.sysco.com/our-locations to find the full details about the Sysco location they wish to contact. According to the Sysco hiring policy, all the candidates for employment must be over the age of 18 to be admitted to the application process. Please note that all the applicants below this age limit will be automatically excluded. Candidates are required to send their Sysco job application online through the company’s careers portal, which can be accessed at www.sysco.com/careers. To do so, they must join the company’s Talent Community and create an account on the portal. Candidates must join the Sysco Talent Community to be able to fill out the employment form. They can browse jobs by category, by location or by company groups and they will be presented with a full list of available positions at Sysco. Then candidates can proceed to make their career selection by reading the descriptions of the positions to see if they meet the requirements of their chosen jobs and if they are compatible with the profile of the position. For this section of the Sysco online application form, candidates must provide their main contact details. Please note that these will be used by the Human Resources department to contact them regarding the following sections of the hiring process. For the first section of the Sysco application form, candidates must fill in their main contact details. Candidates may upload their resumes and cover letters to this section of the Sysco application form. Please note that this section is not compulsory and that applicants may proceed to the following steps of the form even if they choose not to provide these documents. This section of the Sysco job application form requires candidates to provide detailed information about their previous employment. They can add information about as many positions they think could recommend them for the Sysco career they are applying for. For this section of the Sysco application form, candidates must provide information about their professional experience. For this section of the Sysco application form, candidates may upload the additional documents of their resumes, such as diplomas, transcriptions, or references. 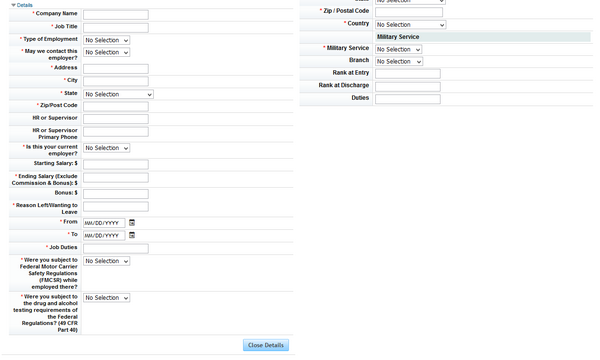 This section of the Sysco job application form requires candidates to provide additional information about themselves including their complete address and military status. If candidates wish to provide information regarding any employment gaps that they might have had in their career, they can do so in this section of the Sysco job application form. For this section of the Sysco job application form, candidates must provide information about the main academic programs that they have been enrolled in. They will be asked to mention which was the last program they have attended and whether or not they have graduated. 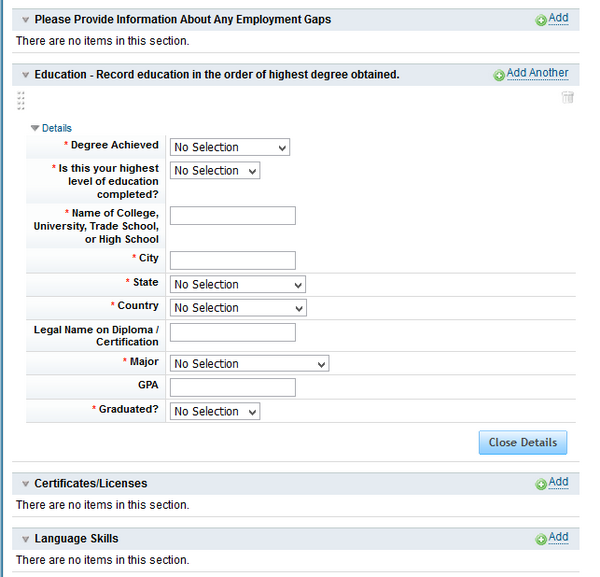 Candidates must provide information about their education history for this section of the Sysco application form. Candidates may provide information about the certificates or licenses they may hold. Please note that this section of the Sysco application form is entirely optional. Speaking foreign languages may be useful for certain Sysco careers. As such, candidates are asked to mention the languages they speak and their proficiency level of their abilities. This section of the Sysco job application form requires candidates to answer a set of pre-employment questions meant to assess whether or not they meet the company’s hiring criteria. They will also be asked to mention their preferences regarding the positions they have chosen. This section of the Sysco application form allows candidates to choose their employment preferences. For this section of the Sysco application from, candidates will be asked to provide information regarding any previous crimes that they might have been convicted for in the last seven years. Please note that this section of the form is mandatory. Candidates will not be able to submit their forms unless they answer these questions. This section of the Sysco application form requires candidates to provide information about their gender, race, and ethnicity, as well as their disability and veteran status. Please note that they are not obligated to answer these questions. If the event that they do not wish to disclose such information about themselves, they will be asked to choose the “I do not wish to provide this information” answer. 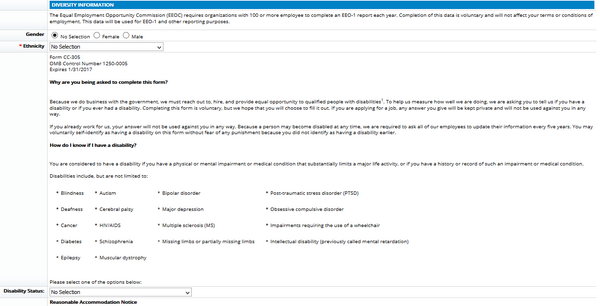 This section of the Sysco application form requires candidates to provide details about their gender, race, ethnicity, as well as their disability veteran status. This is the final section of the Sysco employment form, which requires candidates to read the terms and conditions of the application form. They will be asked to provide their consent to these terms in order to submit their forms for assessment. After submitting their employment forms, candidates will be able to keep track of their Sysco application status on the company’s careers portal. They will be able to see when the formal analysis of their application has been completed. At this point, they will be contacted by the Sysco hiring specialists. Candidates must read the Terms and Conditions of the Sysco application form and if they agree to them, they can proceed to submit their applications. 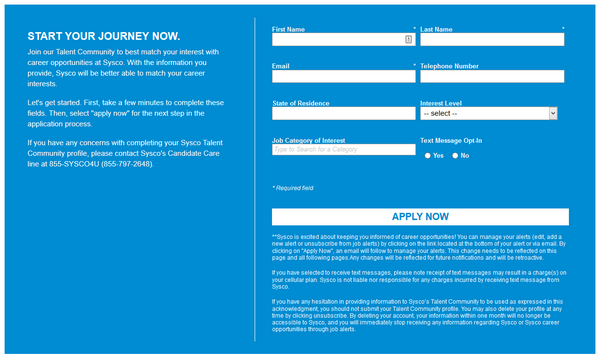 Job seekers can browse Sysco job openings on the company’s careers portal. They can find more tips for applying at Sysco in the following sections of this article. The main responsibilities of Sysco drivers are delivering products to the assigned destinations within the instructed time frames by using the assigned routes. According to the specific requirements of the clients, drivers may be asked to transport the products to designated storage areas and collect payment for them. Sysco salaries for delivery drivers range from a starting rate of $36,000 per year to as much as $86,000. Additionally, Sysco employees are entitled to cash bonuses meant to reward outstanding performances. The complete list of Sysco careers in management can be found on the company’s careers portal. Candidates must submit their Sysco online application forms to be considered for these positions. Warehouse managers are required to coordinate the activities involving inbound and outbound warehouse operations. The main responsibilities of the position are managing the activities related to product receiving and replenishment, order selection and loading, ensuring that all warehouse operations are in line with government regulations, expense management, revenue management, and managing the full warehouse staff. Sysco warehouse manager salaries range from $48,000 and $77,000 per year. Aside from this base salary, managers are entitled to comprehensive performance bonuses meant to repay their dedication to the department. Healthcare Sysco Employee Benefits: Medical, Dental, Vision, and Prescription Plans. Insurance Sysco Benefits: Life and Disability Insurance Plans. Paid Time Off Sysco Employee Benefits: Paid Holidays, Paid Vacations, and Personal Days. Retirement Sysco Benefits: 401(k) Retirement Plan. Financial Sysco Benefits: Sysco Employee Stock Purchase Programs, Pre-Tax Savings Opportunities. Special Sysco Benefits: Sysco Employee Discounts. To create a high-quality application, candidates are advised to provide comprehensive information for their Sysco employment forms. As such, they are advised to fill out all the sections of the form, including the ones which are not marked as mandatory, such as those regarding certificates and licenses and language skills. It is very important that they provide a resume for the Sysco application form because this will reflect their dedication to the hiring process. Their resume must be updated so that it can provide the Human Resources department with complete information about the candidate. The resume should be accompanied by a cover letter and other additional documents, such as diplomas or references. The cover letter provides applicants with the opportunity to relay the main reasons why they are solid candidates for the positions they have opted for. Even if candidates choose to add a resume, we strongly recommend that they take the time to add complete information about their previous positions to the Employment History section because the candidate profile will be assessed first by the Sysco hiring specialists. The Sysco online application form does not provide a review step and as such, it is essential that candidates check the accuracy of the information they have added before submitting the employment form to the Human Resources department. They should check for spelling and grammar mistakes, as well as data inaccuracies so that they Sysco job application form relays the correct information about them. The Sysco hiring process includes two main steps: the application review and the interview process. During the first step, the Human Resources specialists will analyze the employment forms that have been submitted for a position and they will select the best candidates based on their professional skills. For the second step, the top candidates will be contacted to set up interviews where they will be assessed by the HR specialists and the Sysco hiring managers. The interview process may include up to four job meetings, depending on the career level of the available position and the department it is included in. Candidates may be asked to attend one-on-one meetings with the Sysco hiring managers or group interviews, where they will be assessed alongside other applicants for the same position. The full details about the development of the meetings will be explained to candidates when the HR specialists contact them. Candidates for Sysco employment are expected to be familiar with the profile of the company and the main types of services they offer. As such, we advise job seekers to explore the company’s official site, www.sysco.com and to conduct a thorough research on Sysco because this will enable them to provide solid interview answers. They should opt for business attire for the job meetings and they should make sure that the style is properly correlated with the types of positions they are applying for. They should opt for discrete accessories in warm colors that compliment their clothing. It is also very important that candidates arrive at the job meeting 10-15 minutes prior to the appointed time. 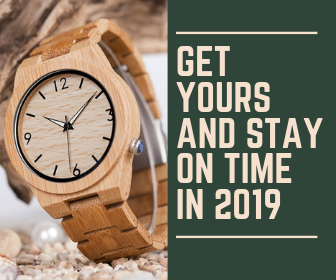 They should identify the best itinerary to the designated location to avoid being late. We strongly advise candidates to go through the following sample interview questions and to think of the answers they would give if these were the questions they were asked during their job meeting. This practice will enable them to provide more eloquent answers on the day of the interview. Why have you chosen to apply for Sysco employment? What in your professional experience recommends you as a solid candidate for this Sysco career? Why would you hire yourself? Could you please tell me about a time when you had to handle multiple responsibilities? How did you manage to organize your activity? Could you please tell me about a time when you have made a bad sales call? How did you manage to recover? Try to sell this pen to me. Hello Daniel, my name is Elizabeth Nunez i recently applied for sysco for dry order picker position i got an email from them with a link to complete a interview on my phone i completed that and i havent heard anything back yet? Can u point me in the right direction on who to contact please and thank you. You can contact the Sysco careers support department at 1-855-SYSCO4U / 855-797-2648 or syscocareers@corp.sysco.com. hi i am apply for sysco company for accountant job but here is one consultancy are cheat me,my money is lot of spentso please Sysco give me right way, how to apply for Job in Sysco company. Follow our guide to see how you can apply for the desired position directly through the Sysco careers website!